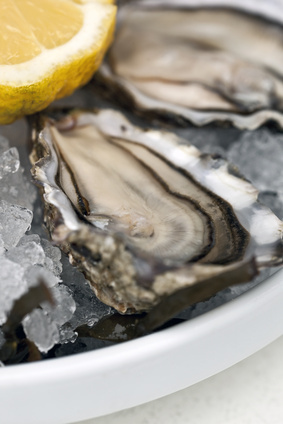 The Accidental Locavore has had oysters on the brain for several reasons. First, I had some amazing oysters recently at a place I hadn’t been in years – the Oyster Bar at Grand Central. I owe a big thanks to my friend Donna for suggesting a drink there recently. I had some Totten Virginicas oysters that have quickly vaulted to #1 on my oyster list! Sweet and meaty, they’re only available for a few months according to our server, so get out there soon and check them out, then thank me! Secondly, it’s been Valentine’s Day, so there’s that connection. Need I say more? Thirdly, oysters have been on lots of menus and cooking shows, most recently a new (to me) show on the Cooking Channel, The Little Paris Kitchen, probably the best cooking show shot in the smallest kitchen – check it out if you don’t believe me. In a recent episode, she was making mignonette sauces for oysters (and check out the most perfect tiny cubes of watermelon her “sous chef” cuts). The last reason is the least happy, and probably the reason I’ve been drooling over all mentions of oysters (or else it’s just because I love them). I had ordered four dozen oysters from Hood Canal Seafood through a Groupon that have never been delivered. Therefore, the reference part of my brain has for months been trying to remember interesting things to do with oysters, especially since 48 of them were supposed to be coming my way. 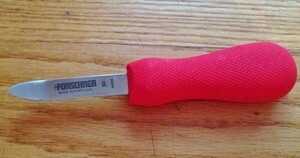 I even practiced my best shucking techniques with my new bright red oyster knife! It’s been almost a year since I started trying to get my oysters from Jane at Hood Canal. Somehow, between production problems and weather they’ve never been shipped. I’ve tried calling and emailing with no results and besides it being horrible customer service, it’s very disappointing! Groupon was no help, referring me to some class action suit that’s pending. So, I’m just sitting here playing with my knife, wishing I had something to shuck with it. What would you do with 48 oysters? Wellfleet oysters are great! I’ve never tried oysters with black pepper, but will definitely give it a try. 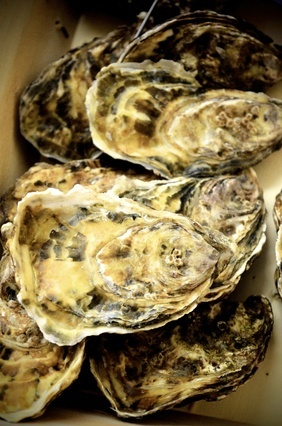 A Locavore, my favorite oysters are Wellfleet oysters (Wellfleet harbor, Cape Cod). Maybe you will get them in time to make oyster stew for Thanksgiving!